Well, here goes: Daniel and I are out of control with Mexican food. To keep it healthy and add in a little more variety (addiction justification #4956), I’m switching up the wholesome ingredients, like using quinoa in place of brown rice, or pinto beans for black beans. This quick casserole is our latest favorite. First of all, it’s like a giant burrito bowl, with quinoa, black beans, tomatoes, onion, cilantro, and cheese! Second of all, casseroles are not only pure comfort, but they’re kind of the gift that keeps on giving: leftovers! 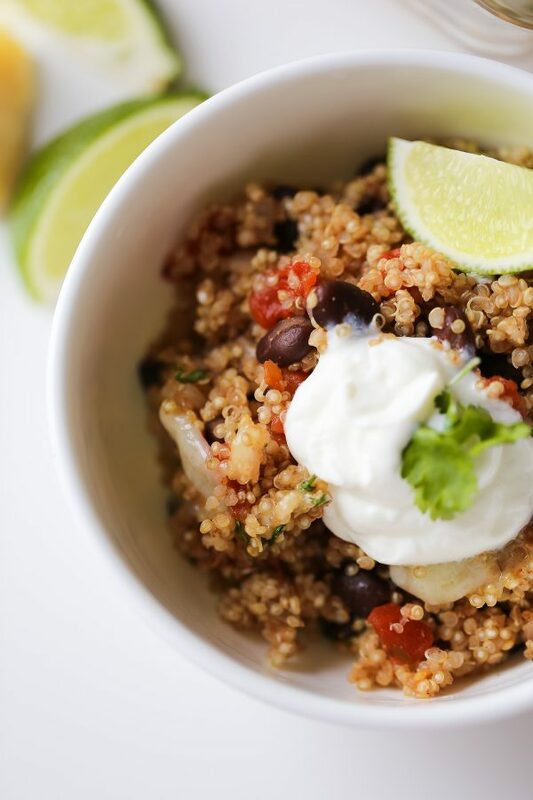 Now, as healthy as quinoa is, it’s a little bland on its own. To boost the flavor here, I sauté a whole lotta garlic and onion in olive oil, add the quinoa to the pan to toast it until it’s golden and nutty, then add College Inn Fat Free and Lower Sodium Chicken Broth, a can of diced tomatoes with green chiles, herbs, and spices, and simmer until the quinoa has absorbed all of that rich, savory flavor. This liquid mixture does wonders for the flavor, but even when you’re just cooking quinoa as a simple side dish, I’d recommend cooking it in broth—either vegetable broth or chicken broth. 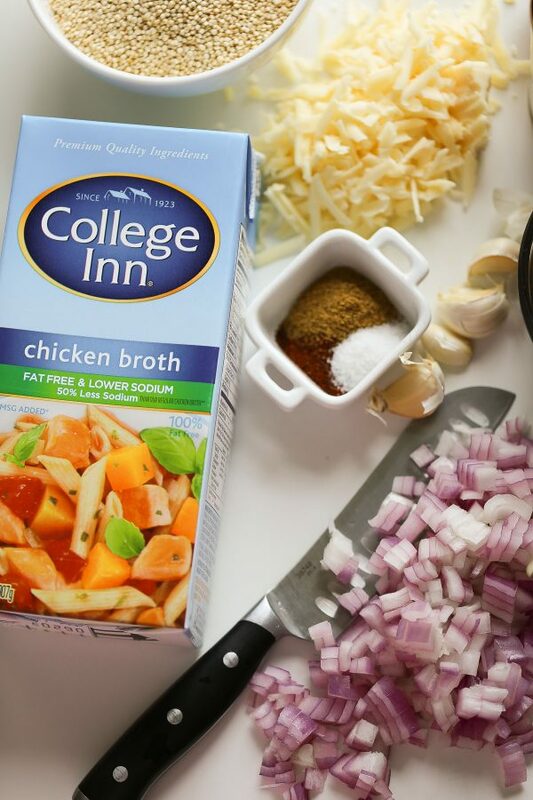 This is something I always do, and the reason I always keep a few boxes of College Inn broth in my pantry, because their broth adds a richness that I can’t get with water alone (and for only 5 calories per cup!). 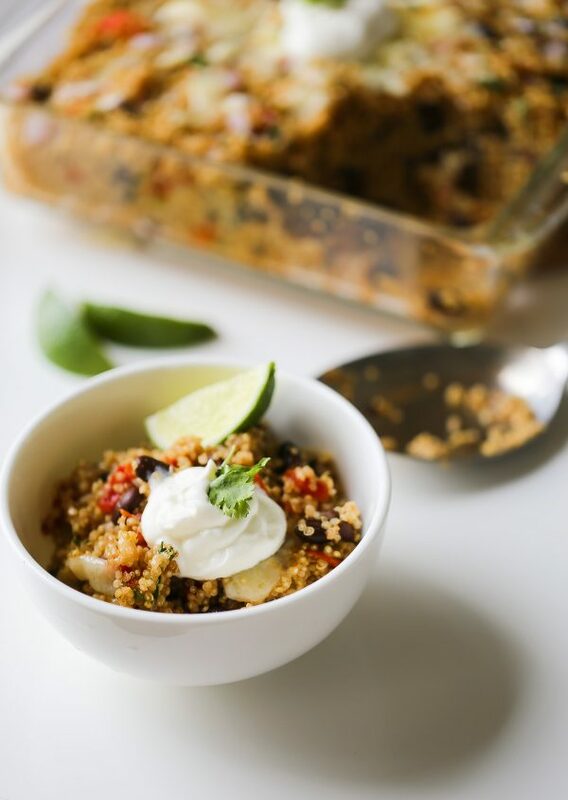 Make this delicious Mexican quinoa and black bean casserole as soon as you can, friends! Enjoy! In a large oven-proof skillet (or a nonstick skillet, which will require you to use an 8-inch baking dish later for baking), heat the olive oil over medium high heat. Add the onion and garlic and cook, stirring frequently, until softened, about 4 minutes. Add the quinoa and stir constantly, until toasted, about 2 minutes. Add the cumin, chili powder, paprika, salt, and cayenne, and cook, stirring constantly to coat the quinoa, onions, and garlic, until fragrant, about 1 minute. Add the diced tomatoes and broth, stir, and bring to a boil. 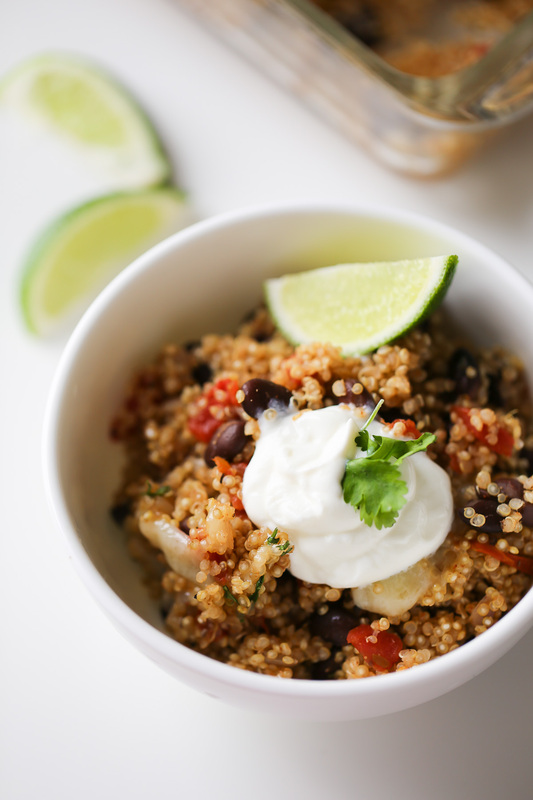 Once boiling, reduce the heat slightly and simmer until the quinoa has absorbed almost all of the liquid, 15 minutes. Stir in the black beans, cilantro, and ½ cup of the cheese. Smooth the top and sprinkle it with the remaining ½ cup cheese. Transfer the skillet the oven (alternatively, transfer the mixture to an 8-inch baking dish) and bake until the cheese has melted, 10 to 15 minutes. Serve in bowls with toppings of your choice, like sour cream, fresh cilantro, and avocado. You had me at “cheesy Mexican”. This was really good! Even my quinoa-hatin’ spouse ate this up. I think the cheese helped, haha! Topped my leftovers with half an avocado for dinner.